It’s week two in our Divergent Month here at A Frame Apart! Last week we looked at prequels with Rogue One versus Indiana Jones and the Temple of Doom. This week, it’s all about sequels! We’re looking at two sequels that are vastly different from their predecessors: the impossibly named Rambo: First Blood Part 2, and Tobe Hooper’s bombastic middle finger, The Texas Chainsaw Massacre 2. 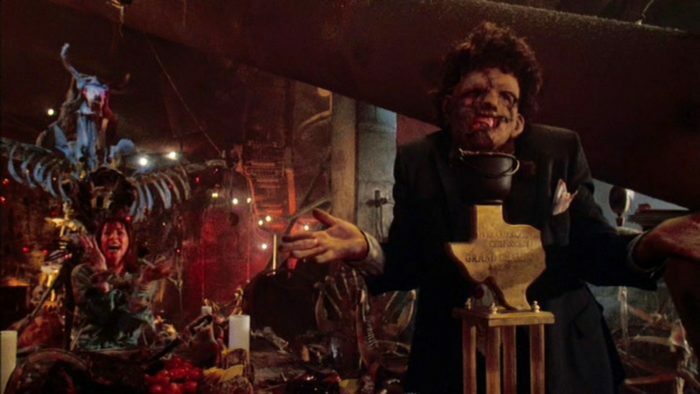 We’re tackling First Blood and the original The Texas Chainsaw Massacre along the way, discussing the immense impact of the latter on pop culture and horror iconography, as well as the weight and message of the former. But how did Rambo go from a PTSD-stricken Vietnam vet to a vengeful murderer? And how did the cannibalistic clan of the rural South go from figures of genuine fear to players in a punk rock Grand Guignol? You’ll have to tune in to find out! You can follow us on Twitter, Instagram, Facebook, and Tumblr. Want us to cover a specific film? Have a concept you want us to talk about? Comments or concerns? Send us an email at aframeapartcast@gmail.com! Be sure to check out Modern Superior’s Patreon page, and please donate to our wonderful podcasting family!